Richard Koproski, a 58-year-0ld Woodford, Vermont resident, told a family member on Facebook that he would shoot him in the head, and that he has plenty of guns to do it with, among other, similar threats, police said. A Darien resident came to Police Headquarters and provided officers with printouts of threats Koproski allegedly made against him. The man said Koproski, who lives near the Darien man’s Vermont home, “had been becoming more unpredictable over the years,” and he knew Koproski had a collection of firearms, police said. Those threats led Darien police to get an arrest warrant and notify Vermont state police about it, police said. Vermont state police said they received word on Jan. 18. The following information, from news releases from Darien police, Vermont state police and a Bennington Banner news report on Jan. 24, include accusations not proven in court. Darien P.D. 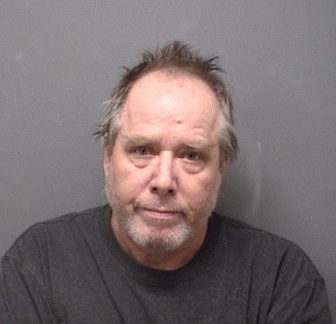 arrest photo for Robert Koproski, 58, of Hickory Road, Woodford, Vermont. Descriptions of the warrants give different details about the accusations against Koproski. A review of the threats showed that Koproski made multiple references to having firearms, being upset with various people, and that he would need a lot of body bags. Other threats are directed at the complainant specifically, threatening to shoot them in the head and that he has an arsenal of firearms. The complainant told officers they felt threatened because Koproski had been becoming more unpredictable over the past few years, and he knew him to own a large number of firearms. The complainant owns a home in Vermont in close proximity to Koproski. The Vermont affidavit, according to the Bennington Banner article, reported Koproski saying that if the victim came to Koproski’s house, it would be “like walking into a grave.” Koproski threatened to shoot the victim in the head. “Koproski also bragged about having a weapons ‘arsenal’ at his home, made references to his shooting skills on social media, and said he cannot need to be held responsible for his actions because of his ‘psychotic state,’ the affidavit states. Koproski was arrested at 2 p.m. on Jan. 21 at his home and without incident, Vermont state police said. Appearing the next day in state court in Bennington, Vermont, Koproski said he wouldn’t contest extradition, the Bennington Banner reported. Darien police said Police Department detectives brought Koproski here on Jan. 30, and Koproski appeared in state Superior Court in Stamford. His bond remains set at $250,000, and his next court date is March 12, according to the Connecticut Judicial Branch website. He is charged with first-degree threatening, a felony, and second-degree harassment, a misdemeanor, according to the website.